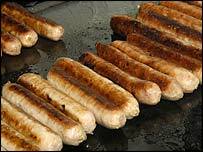 Eating too many hot dogs, sausages and other processed meats can increase the risk of developing pancreatic cancer, researchers have claimed. Meat has been cited as a potential cancer cause in the past, but results have been inconsistent. However researchers at the University of Hawaii suggest the link could be the way meat is prepared, rather than its fat or cholesterol levels. UK cancer experts said more evidence was needed to confirm the link. The Hawaiian team's research was presented to the Annual Meeting of the American Association for Cancer Research. Scientists studied 190,545 people who were part of the Multiethnic Cohort Study in Hawaii and Los Angeles. Participants were followed up for an average of seven years, and were asked about their diet, smoking habits, family history of pancreatic cancer and ethnicity. The researchers recorded 482 incident cases of pancreatic cancer. It was found that those who ate the most processed meat had a 67% increased risk of developing the disease compared to those with the lowest intake. People who ate a lot of pork and red meat also increased their pancreatic cancer risk by around 50%, compared to those who ate less meat. There was no increased risk linked to eating poultry, fish or dairy products. Dr Ute Nothlings, of the Cancer Research Center at the University of Hawaii, who led the research, said: "The results suggest that carcinogenic substances related to meat preparation, rather than their inherent fat or cholesterol content, might be responsible for the association." Dr Nothlings said the increased cancer risk from processed meat could be due to the chemical reactions that occur during the preparation of processed meats. They said such reactions could produce carcinogenic chemicals such as heterocyclic amines or polycyclic aromatic hydrocarbons. Professor Tim Key, Deputy Director of Cancer Research UK's Epidemiology Unit, said the study provided an "interesting perspective" into a possible association between processed meat and pancreatic cancer. But he added: "The weight of research has yet to verify a definite link between the two. "Further research is needed to establish whether or not processed meat does have an effect on the risk of pancreatic cancer. "Smoking remains the only confirmed cause of pancreatic cancer. A diet rich in cereals, fruits and vegetables has overall health benefits and probably has protective benefits for some common cancers, such as bowel cancer."